Hamayun was the 2nd Mughal Emperor of India and a direct descendant of the great conqueror and Uzbek national hero, Amir Timur. On his death in 1555, Hamayun's widow commissioned his mausoleum to be modelled on Gur-e Amir, Timur's mausoleum in Samarkand. 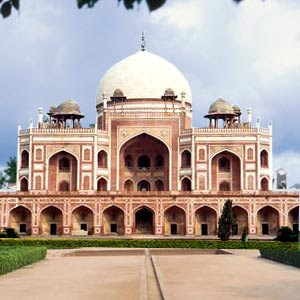 The Aga Khan Trust for Culture is undertaking conservation works on the World Heritage Site of Humayun’s Tomb in New Delhi. Its challenge has been to replicate the tile making process of Hamayun's 16th century tomb. 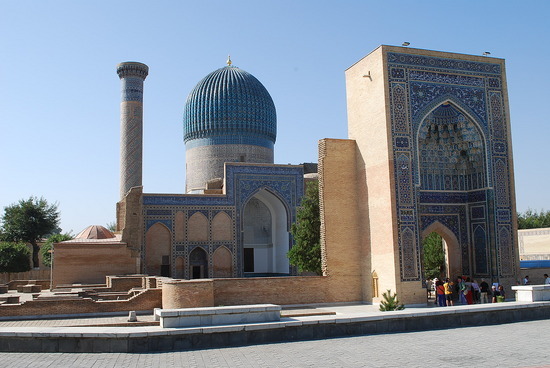 After testing in Oxford University, Barcelona, India, Iran and Uzbekistan, the Uzbek technique was found to be the closest to the original process. Samarkand master craftsmen Namandjon Mavlyanov, Kurbon Melikov and Bakhodurkhuja Rakhmatov spent weeks on site experimenting and have now created the exact five shades of tiles that the Mughals originally used. These artisans are now training local Indian craftsmen in the techniques. Read more about this project.